When I participated on the running bloggers panel at the Route 66 Marathon Expo, one of the questions we were asked was what advice we had for first time marathoners and half marathoners. It is a good question, one that I would break into two parts – training tips and race day tips. It occurred to me many people have probably set the goal of running their first endurance event this year. Now that they have set their goal, they may be thinking about how to achieve their goal of running a marathon or half marathon. Where do you start? In this post, I will share my training tips. I’ll write about race day tips later. I am not going to bother to go over training plans. I am not an expert in how to train. In fact I still rely on a running coach to get me ready for a marathon. Some running stores offer training programs to prepare for races. There are plenty of training plans available on the Internet from running experts like Jeff Galloway, Hal Higdon, and Jenny Hadfield. You can also train with charity programs such as the Leukemia & Lymphoma Society’s Team in Training (TNT). In exchange for fundraising, the charity provides a training plan, supported weekly long runs, and entry into a specific event. I have run 11 races for charities. It is rewarding to cross the finish line knowing that I have helped someone else while participating in an event. This spring I will be running the Boston Marathon for a charity. Whatever training plan you use, I recommend that you follow it to the letter. There is a reason why they tell you to cross train or stretch. I have always done better when I don’t ignore the portions of a training plan that I don’t like. Okay, now to the advice that you probably will only hear from me. 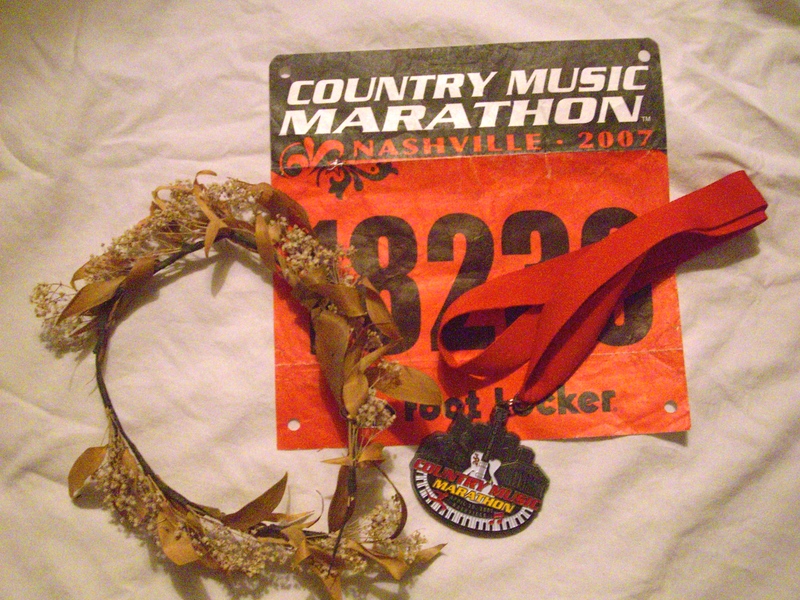 Know the Course – My first marathon was the Country Music Marathon in Nashville. I watched the video of the course that was posted on the race web site. By the end of the video, I was terrified. What had I signed myself up for? I was convinced I would never be able to finish the race. I decided to approach the course like it was an enemy I needed to conquer. To beat it I needed to know the course very well. I printed out the course map, which included the elevation map (or as I call it, the EKG line), and studied it. I knew every turn and hill along the course. Each time I ran, I visualized myself running the race. At the end of every training run, I saw myself crossing the finish line. After each of my long runs, I would highlight that distance along the course map. For example, when I finished my 16 mile training run, I highlighted the course map up to the 16 mile marker. It was a visual reminder of the distance that I had already run. If I could run it in a training run, I could run it on race day. By knowing the course inside and out, I didn’t have any surprises on race day. I knew exactly where I was all the time and what was coming up ahead. I beat the course that had once terrified me. Treat every training run as a dress rehearsal for race day – During your training runs, you should be doing everything exactly as you plan to do on race day. That includes having the same breakfast you plan on having on race day; wearing the same running clothes and shoes; using the same hydration and nutrition you will have during the race. By trying things out before race day, you will find out what works for you and what doesn’t. If you travel to a race like I frequently do, confirm how you will get your preferred breakfast on the road. Will you be able to get oatmeal at 4:30 AM in your hotel? If not, then you might want to try other breakfast options while you are training. Find out what sports drink they will have along the course and try it during a training run. If you can’t handle the sports drink the race will have, then you will need to come up with an alternative hydration strategy. You might want to carry your own fluids, which means getting use to wearing a hydration belt. When I ran the Tokyo Marathon, runners were not allowed to carry any fluids. We had to rely solely on the water stops. I always carry my own hydration so I was concerned. I needed to figure out how I would handle this on race day. My strategy for training for this restriction was to practice only taking fluids during my training runs at the corresponding miles where the water stops would be on the course. On race day, I was prepared and everything went smoothly. I remember training for the Wine and Dine Half Marathon at Disney World. Back then the race started at 10 PM at night. I wasn’t sure how I would handle a race that started when I normally would be asleep. To prepare for the race, I ran a couple of training runs at night. I learned that I needed to adjust my pre-race meals plus take a nap in the afternoon. I was prepared and it ended up being one of my all time favorite races. I used a similar strategy when I trained for the Disney World Dopey Challenge (5K, 10K, half and full marathon over 4 consecutive days). I practiced running increasingly long distances over 4 days. My Dopey dress rehearsal helped me understand how tired my legs would be each day. I adjusted my post-race recovery plan to ensure I would be ready for the next day’s race. Actors use dress rehearsals to ensure they deliver the best performance on opening night. Runners can ensure they have the best race possible by using the dress rehearsal strategy too. Run in all kinds of weather – While many runners love running in the rain, I hate it. (I wrote about being a fair weather runner in an older post, Embrace the Weather.) Given a choice, if the weather forecast is for rain or snow, I reschedule my run to another day or run on my treadmill (or as I call it, my dreadmill). But who knows what the weather will be on your race day. It isn’t like the race directors will move a race indoors if the weather is bad. Not every town has indoor tracks. Where would they get thousands of treadmills on a moment’s notice anyway? I recall when the Mississippi Blues Marathon was canceled two weeks ago, someone on Facebook asked why they just couldn’t move the race indoors. It just isn’t one of the contingency plans for a race. Except for ice or thunderstorms, you need to be prepared to run in whatever weather greets you on race day. Do you have any tips you would offer to new marathon runners? What helped you get through your first race? What did you learn the hard way?